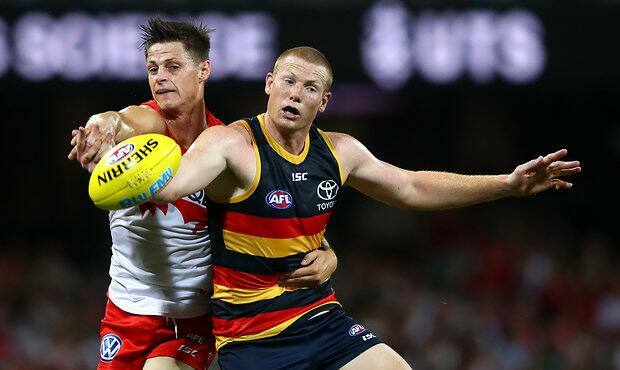 ADELAIDE has been dealt a massive blow with star ruckman Sam Jacobs facing six weeks on the sidelines following knee surgery on Wednesday. The 31-year-old hasn’t played since taking a knock to his right knee in the round two win against Sydney at the SCG. Ongoing meniscal symptoms prevented Jacobs from completing full training on Tuesday and surgery was deemed the best option. “Given the complex nature of Sam’s meniscal pathology, a period of time and conservative management was first required,” Crows science and medical services coordinator Steve Saunders said on the club’s website. “It became clearer this week, with persisting meniscal signs under graduated load progressions, that surgical intervention would serve him best in both the short and long-term. Reilly O’Brien, who has played the past two matches, will continue to the lead the ruck in Jacobs’ absence. The Crows are languishing in 14th place with just one win ahead of Sunday’s clash against Gold Coast at Adelaide Oval.